Today's Draw: The Happy Squirrel. Do you pretty much live inside your comfort zone? Or are you someone who really likes to push into areas that are unfamiliar to you? Depending on your answer, what holds you back or spurs you on? Today I broke with tradition and purposely chose a card, instead of randomly choosing one. I did this because the odds of me ever randomly choosing the Happy Squirrel are rare. 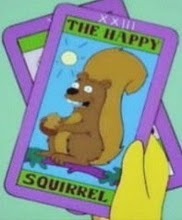 See, out of thousands of tarot decks, only about 10 decks have a Happy Squirrel card. Personally, I have five decks with a Happy Squirrel. All of them are decks I only use occasionally in my daily draws. So, well, I wanted to do the Happy Squirrel and wasn't willing to wait for it to come around. The first Happy Squirrel card I ever saw was in the Touchstone Tarot, which is traditional with classical oil painted type imagery. Very unexpected for such a serious deck. But that makes it even better. I've never had the Happy Squirrel come up in a reading. 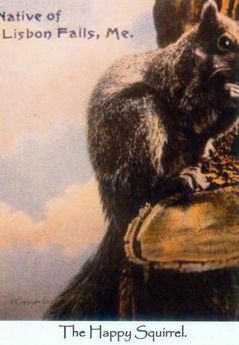 But I would interpret it the way I see squirrels, which is fearless and in-the-moment. I'd also interpret it as playful and carefree, like the deck creators who include it in their decks. Until recently, I had a squirrel condo in my tree. Every spring some pregnant squirrel would move in and raise her babies in this hollowed out branch. This year there were four babies and I used to love watching them in the evening as they would poke their heads out of the holes looking for their mommy to see what she was going to bring back for dinner and what stories she'd have from her day. The branch fell down a month or so ago, so I don't know what the squirrels will do for a condo next spring, but I hope they find a place in what's left of that branch. Anyway, I watched these little guys grow from babies to full-on squirrels. And in doing so, I saw their different personalities. One was a total daredevil who would make nearly impossible leaps from branch to branch. Another was a bit more shy, never straying too far from the condo. They would play and chase each other. They would tease my dogs. And eventually all moved out and went on to create their own individual squirrel lives. So I see squirrels as being daring and adventurous and playful. And in order to be that way, they have to act without ego and fear. I think we rob ourselves out of so much fun because we're afraid of how we'll look or whether or not we'll fit in or what the consequences will be. So we contain ourselves. We don't try to make those heroic leaps from limb to limb that a squirrel does. And because we never push at our edges, we have no idea of just how far our potential goes. And therein lies the "happy" part of the Happy Squirrel—when there's nothing to fear, there's little to take the edge off your happy. In my day to day life, I don't take many risks. In fact, I live pretty safely. But now and again I'll do something fearless. I like being fearless. And I think I'd like to be more of the kind of person that would bungee or skydive, but I'm not. The kind of risks I'm willing to take are the ones with consequences that might set me back a little, but not kill me. As a result, I think I'm a lot less physically confident than otherwise. How about you? Main image is from The Simpsons. 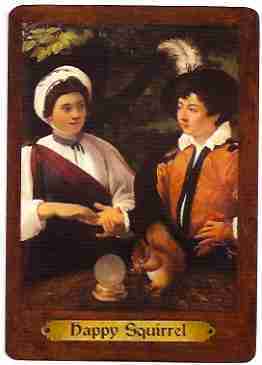 The second is from the Touchstone Tarot. Third from International Icon Tarot and the last one is from The Picture Postcard Tarot from Marcia McCord.